Radiant Oasis: Join us for a tour of our Master Bedroom. It's time for a tour of our master bedroom. I wanted our master bedroom to have the feel of an old Hollywood romantic hotel room. I choose a deep gray for the walls by Sherwin Williams called "Mink". I decided that I wanted to have a mostly white and gray bedroom with accents of deep purple and silver. We purchased our bedding at Bed Bath & Beyond and it is House of Dereon, I have not been pleased with the quality of this set and would not repurchase it. Our king size upholstered bed was purchased from Overstock, we absolutely love it! The large mirror between our two windows was purchased from Ross for just forty dollars! The window treatments have sunburst grommets and were also purchased from Bed Bath & Beyond. 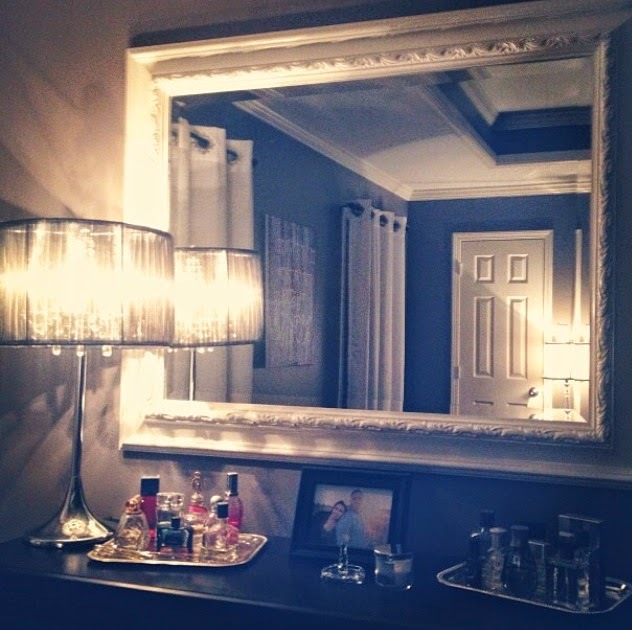 Our lamps were purchased from TjMaxx, they are beautiful and put off a soft radiant light. Our dresser and the mirror above it were both thrift shop finds that have been DIY'ed. The mirror was a brass color before and I primed and painted it white. I found these silver trays at our dollar tree and used them to display our perfume and cologne. The chandelier lamp was a gift from a very special person and I adore it. There is always a bath and body works candle burning in my house. They will fill your entire home with the most delicious scents. My husbands ring holder is also on our dresser this was purchased after he lost it in the trash, ha! Our bedroom is a quiet place of rest and relaxation and we enjoy the peace that it brings. Links below to items mentioned, or duplicate items for those purchased at discount stores.